Be a space expert with the iPhone! I love space, anything to do with space, stars, planets, satellites, rockets, asteroids (from a distance) and iphones! Combine a couple of these together and I'm as happy as a pig in the proverbial mud! NASA is a free iPhone application on iTunes that allows me, the spaceman wannabe, to know just enough about what's going on to sound like I know what's going on, without actually getting hurt. 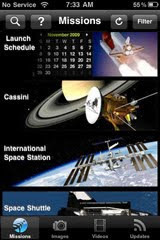 With this iPhone app you can track space shuttle missions and launch schedules. There are plenty of satellites up there to view as they pass over your house at night. The map shows the trajectory of the pass from the location on your iPhone's GPS. For example, the ISS (International Space Station) has been in orbit for 4136 days, 13 hours, 17 minutes, and 9 seconds... NOW! There has been a crew onboard for 3423 of those days. There are pictures, movies and even a link to the latest ISS news. The application map (similar to the iPhone map) shows the ISS passing over New York right now at about 18,000 MPH and will be over France in just 17 minutes! A great iPhone application that adults and kids will enjoy! Do you remember the old game of Risk? Well there is an iPhone app that is similar, not the same of course, that is called Conquest. In the game you combine risk and strategy to conquer the world! Conquest is a great combination of playing a fantastic retro-like game on a modern day format!